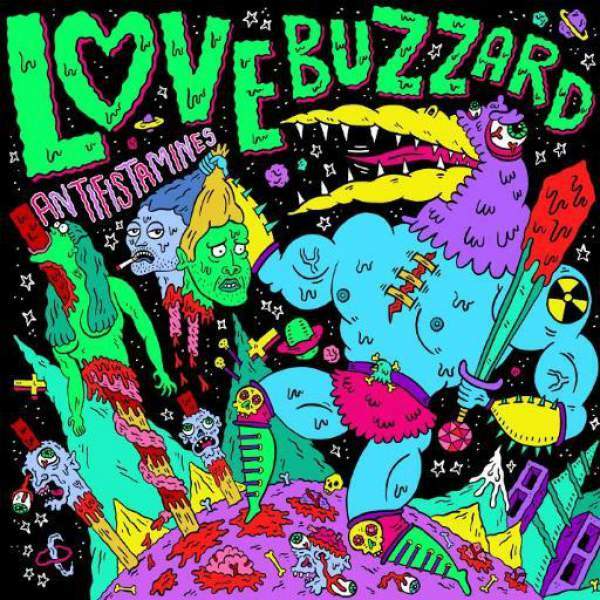 London-based duo Kevin Lennon and Al Brown make up the wonderfully named Love Buzzard. If you think that their moniker sounds a little bit twee though, rest assured that there’s nothing particularly gentle about the music the pair make. They’re purveyors of wonderfully scuzzy and energetic garage rock that’s antagonising and uninhibited, and that’ll either make you want to bathe in its glory or run away in terror for fear that your ears might bleed. 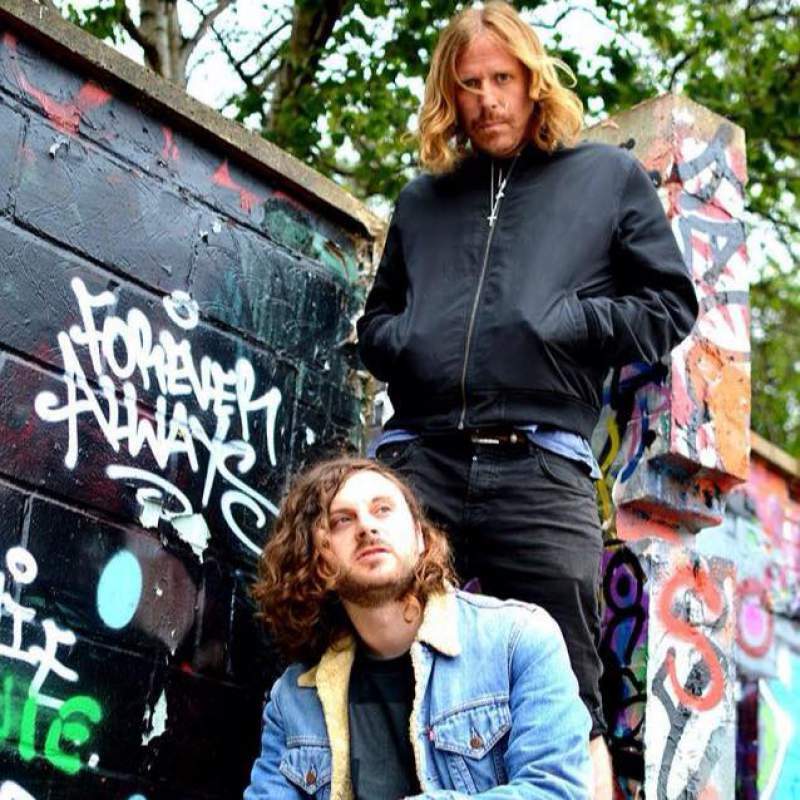 Love Buzzard isn’t a band for the faint hearted – which is probably why they’ve landed slots supported the equally unhinged Cerebral Ballzy and Slaves – but if you like your rock untamed, feral and ferocious with a good dose of debauchery then Lennon and Brown are making your ideal soundtrack. This week the pair are playing a headline show at Sunderland’s Independent and I had a quick chat with them to ask more about their debut album Antfistamines, their lovingly drawn LP artwork and their relationship to Fluffer Records. Tell us a bit about your debut album, Antifistamines. What can we expect from it? Antifistamines is basically a collection of all out favourite tunes that we have written so far since we formed, which was about two years ago. We recorded the album in a week at Soundsavers studio in Homerton London. The album is full of short sharp fuzzy garage tracks. Who or what have been your major inspirations behind the album? The tracks on the album pretty much come out of jams in the rehearsal room which we would record listen back take out our favourite bits, condense into a song and then mould the vocals into lyrics. We try and keep everything as raw and simple as possible. We try and avoid being lumped in with the usual “two piece” kinda vibes as much as possible and would say that our inspirations come from a wide range of sources and genres. To name a few bands who have probably influence our sound id say bands like the gun club, the meteors, the cramps, 60s garage and psych and there is a fair bit of rockabilly vibes leaking in various tunes. You say on your Facebook page that you’re “lusty predators with bluesy riffs and rock and roll glam debauchery” – is that your way of saying that you’re kind of like musical magpies who take inspirations from a lot of genres? Or am I reading too much into it? Yeah it’s fair to say that we won’t limit ourselves to any particular sound. Is the rock and roll glam debauchery confined to the stage or does it spill over into the dressing room? That all depends on how much beer the venues dare give us haha! Who did the artwork for Antifistamines? It’s amazing! Our good friend Russell Taysom does all our artwork and he is amazing! Check out his other illustrations it’s all awesome. You’re one of the first bands to release albums and EPs on the Fluffer Records label; what’s it like to be signed to such a fledgling label? Well we set up Fluffer with some other mates as a platform to launch our own music and put on shows with bands we would wanna see. We released everything previous to the album on Fluffer but now we are signed to 1234 records who will be releasing the album, which is awesome as it opens up more opportunities than self-releasing through Fluffer. For anyone who hasn’t seen you play live before, what can we expect from the Love Buzzard gig at the Independent? Lots of energy and tasty raw noise with lots of sweat! Love Buzzard play at Sunderland’s Independent on Friday 26th June.